The extermination of terrorists, airdrops and drone missions have been successfully performed by Russian, Serbian and Belarusian troops during joint drills in Serbia. New airdroppable medical equipment has also seen action for the first time. The active phase of the anti-terrorist drills successfully concluded on November 9. Troops practiced parachute landings, marching, live firing, assaults on the bases of simulated terrorists, reconnaissance with the use on unmanned aerial vehicles, the evacuation of the wounded, bomb disposal and other activities. “Russian military transport aviation has fulfilled all the tasks in the active phase of the drills. "Personnel and vehicles have been transported to the drop points swiftly and precisely, despite harsh weather conditions,” Deputy Commander of Russian military aviation Colonel Vasili Galiy said on Saturday. Around 250 Russian troops, three transport aircraft and a number of vehicles, including quadbikes, IFVs and UAVs, took part in the active part of the military exercises, which ended on November 9. Russian troops will stay in Serbia until next Tuesday to participate in the analysis of the drills, according to the Russian Defense Ministry. During the drills, new airdroppable mobile medical equipment, which fits inside the cargo container of an Arbalet-2 parachute, has entered service, according to the Russian Defense Ministry. Along with Russian troops, 450 Serbian servicemen and 50 Belarusian ones participated in the drills. 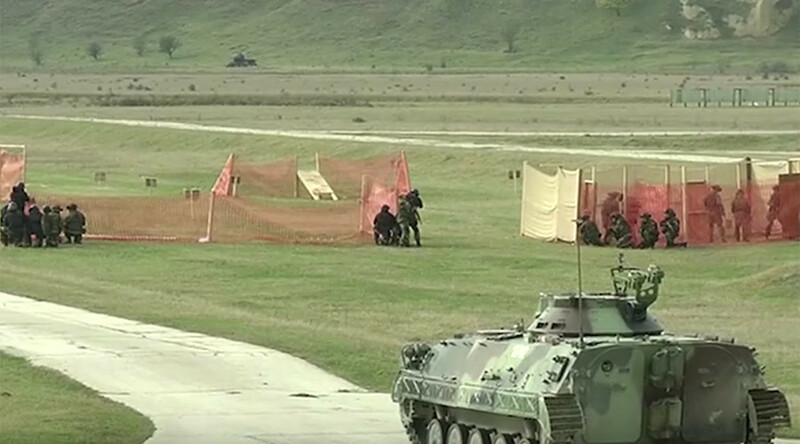 Cooperation between Russian and Serbian paratroopers begun during the SREM 2014 drills in Serbia. Slavic Brotherhood exercises were held for the first time near the southern Russian city of Novorossiysk last year. This year, the drills' organisation and command were the Serbian Ministry of Defense's responsibility.